The 'A' side consists of three pieces - the first being a thin, almost minimal remix of "J.F.R.O. (Rewind Your Mind)" from the "Transfixion" album - emphasis on 'top' sounds - treble instead of bass, this complex piece chops and changes direction from mutant rhythm, through spatial 'travelling' Techno to destroyed Electro-Contamination Grunge. Throughout this odyssey it retains it's constant driving beat. At times it touches the outer limits of Japanese Extreme Noise with it's harsh, fire-alarm-klaxon cacophony. "Factory (Beat The Bishop)", again a total reworking of a "Transfixion" track, this white-noise-and-cacophony reminds me a little of SLEEP CHAMBER crossed with GODFLESH in it's mean, plodding, stalking nastiness - a slow, heavy body of necrosed, damaged, warped to third-speed grunge of sound. The third track is a brief look at the changing sound of SONIC VIOLENCE - called "Project 7", this is a distorted & semi-destroyed cacophony which again might appeal to the Japanese school of Noise Terror, although unlike many of those groups, this has beat & structure, making it danceable as well as dangerous to the listener's mental health. The 'B' side consists of just one track - the epic "Off Your Head" which hungrily eats over 12 minutes of this 27 minuter's spiral scratch. It opens up with odd distorted electronic sounds which grow & fade out of the aether, dragging like asthematics sucking at an elusive breath, joined by dulled heartbeat which itself is usurpedby a swelling clatter of mechanical sound, as if some heinous malengine were moving ever onwards, it's inner noises growing as it's painful attentions become imminant. From this suddenly leaps the bludgeoning thunderous road-drill drums which thump along, themselves mechanical. The music is danceable by it's sheer driving intensity, although it's machine mass might pin the unwise to the wall. It's a post-Holocaust tribal dance, a Shamanic ceremony blessing the Factory, praising the Machine. Powerful, noisy stuff. 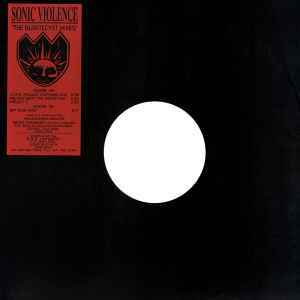 SONIC VIOLENCE are living up to their name, and rather than mellowing as time goes by, they are creating an intense, almost unbreathable wall of noise which makes their previous releases look mild & melodic. A great migraine inducer for those who love a strong sonic kick to get their bodies moving.